Ava is certain that it�s a clue to her elusive past. Twenty-three years ago, she�d been found wrapped in a yellow blanket in the narthex of the Holy Saviour Catholic Church�and rescued�or so she�d been told. Her mother claimed there was no more to the story, so the questions of her abandonment were left unanswered. For Ava, now is the time to find the roots of her mother�s lies. It begins with the house itself�once the scene of a brutal double murder. When Ava enlists the help of the two people closest to her, a police detective and her best friend, she fears that investigating her past could be a fatal mistake. Someone is following them there. And what�s been buried in Ava�s nightmares isn�t just a crime. It�s a holy conspiracy. A woman stood at the bottom of the steps, her swaddled gray hair peeking out above a scarf, her hands stuffed deep in her coat pockets. �Oh. I was looking for the owner, but it doesn�t look like anyone is home. Do you live here, in this neighborhood?� I walked down the stone steps to meet her. I�d been backing up little by little as she spoke, unaware that the sidewalk dipped behind me. I lost my balance and the Polaroid slipped from my fingers. I leaned down and grabbed it, but not before she got a glimpse. �Is that the house?� She took the black-and-white image from me and studied it. I thought about Claire, the woman who�d adopted me, who�d raised me for twenty-two years. She�d always claimed to have no information about how I�d been found wrapped in a yellow blanket in the narthex of the Holy Saviour Catholic Church. Barely six weeks old, she said. Though I�d begged for more details, clues, information, she�d insisted there weren�t any. I suspected this wasn�t the truth, because I had memories�unformed fragments punctuated by vivid recollections that didn�t jibe with her version. It was the ongoing mystery of my life. A project never finished. I�d stumbled and fallen through my teenage years and young adulthood trying to sort it all out. Who had abandoned me, why, and when? When asking questions didn�t help, I resorted to anger, manipulation, and, lately, alcohol to try and forget. Digging through a crawl space after her death, I�d stumbled upon the photograph tucked away with other mementos from my childhood: school pictures, report cards, my high-school diploma, a yellow baby blanket. The photograph had been inside a blank white envelope, sealed shut. Since the day I�d disturbed that seal and seen the image, I�d felt a growing sense of urgency�unfinished business, a chapter not complete. In the two weeks and three days since�while signing papers, helping Anais arrange for Claire�s body to be flown to France, comforting Aunt Marie�I�d returned to the photograph daily: What had it meant to Claire and why had she kept it? The little lies and secrets she�d clung to during life were about to be wrested from her now that she was dead. I stared into the woman�s watery gray eyes. �Who was killed?� I asked. �Did you know them well?� Strands of hair came loose from my ponytail and I tucked them behind my ear. I was listening to her words, but my eyes wandered to the street behind her, waiting for something, though I wasn�t sure what. �Well enough to say good morning, or take in their mail when they were away, I guess. Let me see that picture again?� She held out her hand. I gave it to her just as a car slowed near where we stood. An older man leaned out the window. �Excuse me. Can you tell me how to get to Flourtown?� He was talking to her, but his eyes were glued to mine. I held his gaze while she pointed him in the right direction, then I watched him pull away. She turned back from the car, shaking her head. �Now what were you saying?� She held the picture out, studying the words�almost entirely faded�that were printed after the date. When she shoved it into my hand, it was clear she was afraid. I glanced up at the house; I�d been here long enough. The eyes of the man in the dark car were dancing behind my eyelids, distracting me. Books � la Mode is giving away one print copy of Twist of Faith�yay! What has been the biggest "plot twist" of your life so far? Life is full of surprises. I never thought I'd end up in Sacramento, but my job brought me here and I'm enjoying it thoroughly! Giveaway ends February 14th at 11.59 PM (your time). Hunter Cabot deeply loves two things: the international tea company he�s helped his father build, and his wife, Sara. From the moment he first saw her wide smile on their college campus years ago, Hunter fell hard. Yet now, with other family members pushing to sell the thriving business and Sara grieving their failure to start a family, he�s suddenly facing the crushing loss of both. The relentless ambition that Sara once admired in Hunter is now driving them apart. Each missed doctor�s appointment, neglected dinner date, and family squabble accentuates their differing priorities. Still, Sara struggles to create the home life they�d envisioned, until unsettling developments�both personal and professional�push them to the breaking point. In this one instance, it was a good thing for their marriage. He gently settled her on the bed and quickly fluffed a bunch of pillows for her behind her back and under her legs. He then went to his nightstand and withdrew a jewelry box. Heart melt. These sentimental moments, however fleeting, kept her fighting for their marriage instead of giving up. �I didn�t get you anything.� She grimaced, turning the box over in her hands, feeling comparatively thoughtless for a change. �Really? Our exact coordinates?� Her eyes widened. 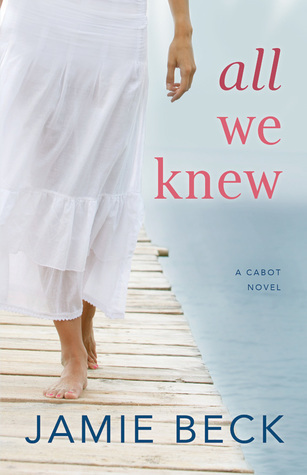 Books � la Mode is giving away two print copies of All We Knew�that's two winners total! Yay! What is the most difficult thing about your marriage or relationship? If you are not committed, what is the most difficult thing about maintaining friendships? Sponsored wholly by the tour publicist�a huge thank you to the lovely folks over at SparkPoint Studio! Giveaway ends February 13th at 11.59 PM (your time). "Doesn�t matter who did it. Not anymore. I did the time. It�s over." When Drix was convicted of a crime�one he didn�t commit�he thought his life was over. But opportunity came with the Second Chance Program, the governor�s newest pet project to get delinquents off the streets, rehabilitated and back into society. Drix knows this is his chance to get his life back on track, even if it means being paraded in front of reporters for a while. Elle knows she lives a life of privilege. As the governor�s daughter, she can open doors with her name alone. But the expectations and pressure to be someone she isn�t may be too much to handle. She wants to follow her own path, whatever that means. When Drix and Elle meet, their connection is immediate, but so are their problems. Drix is not the type of boy Elle�s parents have in mind for her, and Elle is not the kind of girl who can understand Drix�s messy life. Fighting against a society that can�t imagine them together, Drix and Elle must push themselves�Drix to confront the truth of the robbery, and Elle to assert her independence�and each other to finally get what they deserve. Sharp pain in the chest. Of all the ways I saw this moment playing out, those weren�t the words I imagined. It�s not an apology for leaving me behind. It�s not an admittance of guilt. It�s a promise. In my final therapy session in the woods, sitting next to a bonfire I created, my therapist asked what would help me transition back into the real world. I told him I needed the truth. He told me there�s no such thing, but he did tell me that forgiveness was real. Forgiveness. In my mind, forgiveness and the truth go hand in hand. �I didn�t, and you need to admit you didn�t try to find me. Something big had to have happened for you to have ditched me. What was it?� Or did he really think I was gone from the store and saw that as his opportunity to rob it? Yes, his sister needs help, but I need help, too. I look straight into his eyes, and there�s no way he doesn�t see the plea in them to talk to me, but he doesn�t talk. Instead, Dominic pats my back and heads to help his sister. That night, Dominic had walked me to the convenience store, and dared me to shoplift, but then disappeared, and I passed out behind the store. I was too drunk and too high to know my own name, and he left. Disappearing, leaving anyone he loved behind, wasn�t his style, but he was desperate for money. Did his desperation cloud his judgment when it came to me and our friendship? And that night, Holiday was closer to the crime scene than I had known. Both of them had something to gain, both of them felt as if they had nothing to lose, and both of them had motive. But it�s hard to imagine Holiday holding a gun. Dominic, on the other hand, he was capable of aiming a gun, and at the time, he was crazy enough to pull the trigger. Good thing that bullet missed the store clerk or I would have been charged with more than robbery with a weapon and attempted assault. Manslaughter would have messed up my day�for twenty years. Do I know for sure Dominic did it? No. There�s a chance my sister let her ramped-up emotions control the decisions for her that night and that she talked Dominic into it. But eighty percent of me believes it was him alone�my best friend�and I don�t know how to live with that yet. Ratting him out to the police was never an option, because no matter what, I love him. Dominic can�t handle tight spaces, and I could. Dominic wouldn�t have survived. I did. I roll my shoulders, but the tightness in my neck doesn�t go away. How can I forgive someone who won�t admit guilt? How can I forgive when I don�t know who to forgive? Soon I have to announce to the world I�m a criminal, even though I�m not. Sealed records and the truth won�t mean anything once I open my mouth in front of reporters. Guess the therapist was right on the truth. It doesn�t exist. �I need a few minutes to myself.� Food doesn�t sound appealing anymore. Axle returns to our family, and I walk forward, in the same direction as the blonde. Her path has to be better than mine. Follow the tour to continue reading here! Kat Grant and Alice Campbell have a friendship forged in shared confidences and long lunches lubricated by expensive wine. Though they�re very different women�the artsy socialite and the struggling suburbanite�they�re each other�s rocks. But even rocks crumble under pressure. Like when Kat�s financier husband, Howard, plunges to his death from the second-floor balcony of their South Florida mansion. Howard was a jerk, a drunk, a bully and, police say, a murder victim. The questions begin piling up. Like why Kat has suddenly gone dark: no calls, no texts and no chance her wealthy family will let Alice see her. Why investigators are looking so hard in Alice�s direction. Who stands to get hurt next. And who is the cool liar�the masterful manipulator behind it all. At the end of the service, the pallbearers lifted the coffin off the fabric-draped dais and carried it out of the church on their shoulders. The family stood and, led by Kat and Amanda, followed the coffin down the aisle. Her arm linked through her daughter�s, Kat looked wan, her normal vivacity drained away. She was wearing a tailored white pantsuit over a black silk blouse that I hadn�t seen before. I wondered if she�d bought it for the occasion. As Kat approached the pew where Todd and I were sitting, I tried to catch her eye. But she either didn�t see me or didn�t want to acknowledge that she had. Kat�s mother and father, Eleanor and Thomas Wyeth, followed their daughter and granddaughter. Thomas was somber but pleasant, shaking hands with people as he passed. Eleanor looked austere, and other than the occasional gracious nod for a favored few, she kept her chin high and her eyes fixed straight ahead. My pulse quickened at the thought that I�d finally get a chance to talk to Kat, if only for a moment. It was obviously not the time or place for an in-depth conversation, but at least I�d be able to get some sort of read on what was happening. I turned and saw John Donnelly standing there. He looked especially dapper in a dark gray suit and pale yellow tie. He held out his hand and I shook it. �Mr. Donnelly, this is my husband, Todd,� I said. Then, turning to Todd, I explained, �Mr. Donnelly is the attorney who helped me out the other day.� I hadn�t told Todd that the attorney had offered me what was, for all intents and purposes, a bribe if I agreed not to further cooperate with the police investigation. Todd was already worried about the entire situation. I didn�t want to add to his anxiety. �I don�t know that anyone is,� I remarked. �She sounds like a pistol,� Todd said. �Yes, well, you didn�t have to spend Thanksgiving with her,� Donnelly quipped. I glanced at Todd. He looked confused. �Thank you, but we�d like to give our condolences to Kat and her family,� I said, not sure why I had to explain this. �I don�t want to make a scene,� the lawyer said. �Neither do we,� Todd retorted. Margot Hunt is the pseudonym of a bestselling writer of twelve previous novels. Her work has been praised by Publisher�s Weekly, Booklist, and Kirkus Reviews. Books � la Mode is giving away a print copy of Best Friends Forever�yay! I don't necessarily have one single long-term best friend, but rather a handful of best friends from different situations: hometown best friends, some high school best friends (each from different groups), a college best friend, a concerts/parties best friend, a family friend BFF, etc. I know each of them to varying degrees, some better than others. Giveaway ends February 3rd at 11.59 PM (your time). 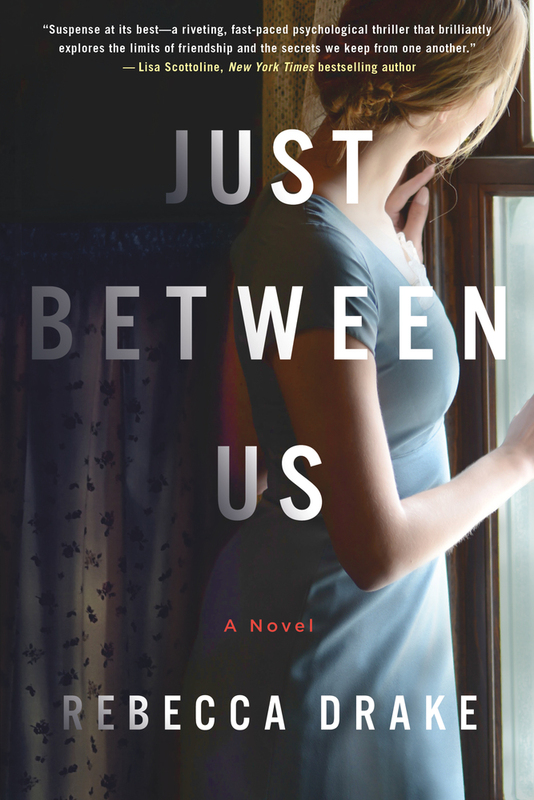 I'd like to welcome Rebecca Drake to the blog today to celebrate the exciting release of Just Between Us from St. Martin's Press, a MacMillan imprint! Welcome to Books � la Mode, Rebecca! Let's get this interview started. 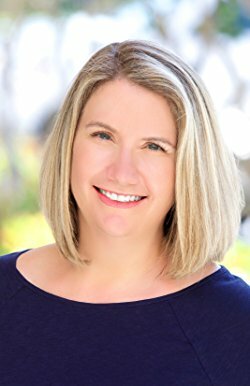 Rebecca Drake is the author of the novels Don't Be Afraid, The Next Killing, The Dead Place, which was an IMBA bestseller, and Only Ever You, as well as the short story "Loaded," which was featured in Pittsburgh Noir. Just Between Us is her latest novel. A former journalist and native New Yorker, Rebecca currently lives in Pittsburgh, PA, with her husband and two children. Alison, Julie, Sarah, Heather. Four friends living the suburban ideal. Their jobs are steady, their kids are healthy. They�re as beautiful as their houses. But each of them has a dirty little secret, and hidden behind the veneer of their perfect lives is a crime and a mystery that will consume them all. Everything starts to unravel when Alison spots a nasty bruise on Heather�s wrist. She shares her suspicions with Julie and Sarah, compelling all three to investigate what looks like an increasingly violent marriage. As mysterious injuries and erratic behavior mount, Heather can no longer deny the abuse, but she refuses to leave her husband. Desperate to save her, Alison and the others dread the phone call telling them that she�s been killed. But when that call finally comes, it�s not Heather who�s dead. In a moment they�ll come to regret, the women must decide what lengths they�ll go to in order to help a friend. Just Between Us is a thrilling glimpse into the underbelly of suburbia, where not all neighbors can be trusted, and even the closest friends keep dangerous secrets. You never really know what goes on in another person�s mind, or in their marriage. As a huge fan of first lines, I�d love to hear the first line of Just Between Us. Could you give us a brief commentary on it? Funerals for murder victims are distinguished from other services by the curiosity seekers. I�ve always been intrigued by the fact that as a society we�re drawn to immerse ourselves in public tragedies. People seem to feel a need to find a connection, however tenuous, with crimes or other calamitous events, and I�ve always found that somewhat macabre and fascinating. My road to publication was long and varied, but I think that�s true for lots of writers. I knew from an early age that I wanted to be a novelist, but it took me many years to realize that dream. I started writing fiction seriously when my children were small and I had a couple of manuscripts in the drawer before having the good fortune to meet and be mentored by author Nancy Martin. She critiqued my then latest effort�it was a hard critique, but very valuable. It took me six months to rewrite that novel and I got my first agent after that. Of course, like most writers, I had dreams of instant success, but that novel didn�t sell and it wasn�t until three proposals later that I landed a contract with an editor who liked my writing. I published three novels, and then I had a slow period, where I was living between the United States and Qatar, in the Persian Gulf, and there were numerous health crises with family members and friends. I kept writing, albeit more slowly, and ultimately I finished another book and found a new agent, who sold it to St. Martin�s Press. That book was Only Ever You, a standalone psychological thriller that came out in 2016. Just Between Us is my latest psychological thriller. I�ve learned that it�s important to be persistent, to be brave, to advocate for yourself, and to learn as much as you can about the business, while staying focused on craft. Ultimately, the only thing writers can control is their craft. Yes and no. Writers pull from their lives all the time, but usually not the way that non-writers imagine. When I was writing my very first crime novel (which ended up in a drawer), I based a character on a really mean boss I�d had, killing him off in different ways through multiple revisions until I finally realized that I kept rewriting the scene because it was cathartic, not because it was important for the novel. Since then, I�ve never based a character on a specific person. However, I�m often inspired by my real life and will incorporate the personality traits of people I know, or their ways of acting or speaking, in my work. For instance, Just Between Us explores friendship and loyalty, and I drew on my own friendships, particularly the way my female friends talk with and about each other, when creating the characters and their bond with one another. Out of all the fantastic books out there, what makes Just Between Us stand out from the rest? 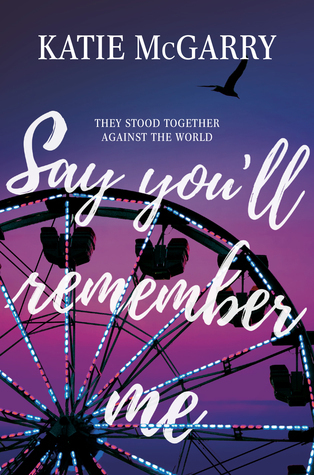 I don�t like to toot my own horn, but since you�re asking me to, I�ll repeat what early readers and reviewers have said, which is that Just Between Us is a fast-paced story with lots of plot twists and great characters that asks some really compelling questions: How far would you go to help a friend? And, how much can we ever know about another person�s marriage? Blog babes, click "Read more" to find out Rebecca's best personal and professional advice. We're also hosting a giveaway for a finished copy of Just Between Us, so you don't want to miss that either! I wish I�d known at the outset something that took me years to learn�when agents and editors say that they want something �fresh� or �new,� what they really mean is familiar with a twist. In order to get published, writers need to be clear about where there novel would be shelved in a bookstore (e.g. mystery, romance, sci-fi) and they need to have an idea that reminds the agents and editors of other successful books in that genre/category, while having something new or different to say. Interesting! That really is an insider perspective that I never would have figured out myself. Now give us your best personal advice�something you wish you had known when you were younger and would offer to your own kids. Take the risk and pursue the dreams you want to, but do so in a smart way. So if your dream is to write novels, don�t up and quit your day job, but do go for it and write that book you have in you. It was a pleasure to be able to get to know you better today, Rebecca! Thank you again for dropping by, and best of luck with future endeavors! What book have you loved so much that you�ve read it multiple times? While I do love a lot of books intensely, it takes a lot of patience for me to revisit anything more than once. I think first reads will always be a different experience, which may hinder your capacity to enjoy multiple readings. That said, I have read The Great Gatsby and The Catcher in the Rye several times each. Rather predictable answers, but both books are classics for a reason! Giveaway ends January 30th at 11.59 PM (your time). Servants and socialites sip cocktails side by side on their way to new lives in this �thrilling, seductive, and utterly absorbing� (Paula Hawkins, #1 New York Times bestselling author) historical suspense novel in the tradition of Agatha Christie�s Death on the Nile and Ken Follett�s Night Over Water. 1939: Europe is on the brink of war when young Lily Shepherd boards an ocean liner in Essex, bound for Australia. She is ready to start anew, leaving behind the shadows in her past. The passage proves magical, complete with live music, cocktails, and fancy dress balls. With stops at exotic locations along the way�Naples, Cairo, Ceylon�the voyage shows Lily places she�d only ever dreamed of and enables her to make friends with those above her social station, people who would ordinarily never give her the time of day. She even allows herself to hope that a man she couldn�t possibly have a future with outside the cocoon of the ship might return her feelings. But Lily soon realizes that she�s not the only one hiding secrets. Her newfound friends�the toxic wealthy couple Eliza and Max; Cambridge graduate Edward; Jewish refugee Maria; fascist George�are also running away from their pasts. As the glamour of the voyage fades, the stage is set for something sinister to occur. By the time the ship docks, two passengers are dead, war has been declared, and Lily�s life will be changed irrevocably. 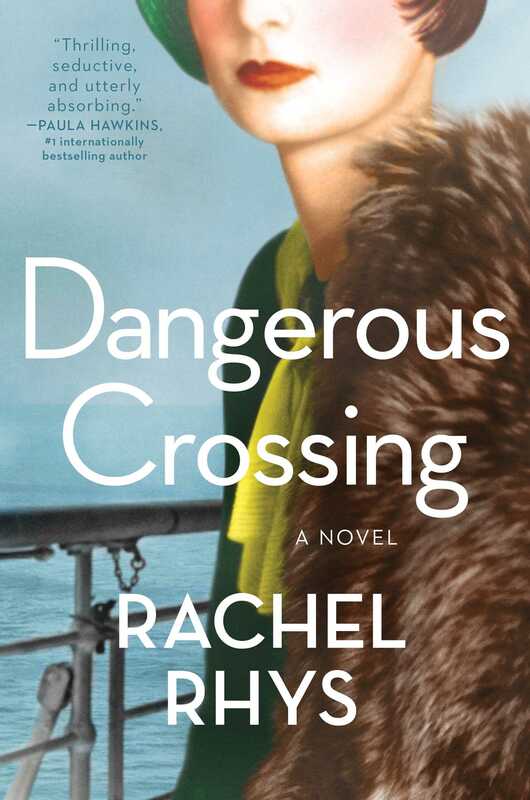 Books � la Mode is giving away one print copy of Dangerous Crossing�yay!! What is the most dangerous thing you've done? I have almost drowned before, but that was unintentionally dangerous. By choice, probably things like staying out too late or riding in cars in the dark, especially when under the influence. To clarify, I have never driven under the influence and do NOT condone drinking and driving, but against my better judgment, have been in a vehicle with non-sober drivers before. It's very dangerous to not be able to trust your own mind, and one second is all it takes for something disastrous to happen. Giveaway ends January 27th at 11.59 PM (your time). In 2016, Eddie is fully grown, and thinks he�s put his past behind him. But then he gets a letter in the mail, containing a single chalk stick figure. When it turns out that his friends got the same message, they think it could be a prank... until one of them turns up dead. That�s when Eddie realizes that saving himself means finally figuring out what really happened all those years ago. The book was inspired by a box of chalk a friend bought for my daughter�s second birthday. We spent the afternoon drawing stick figures on the driveway. Later that night I opened the door to be confronted by these weird chalk drawings everywhere. In the darkness, they suddenly looked incredibly sinister! It was originally called The Chalk Men. The day before submission my agent said: �You know, I really think it should just be The Chalk Man.� A one word change that made such a difference. Like a lot of books, it went through several drafts. A secondary character was cut and in the very first draft, the killer�s identity was different�but I�m not saying who it was! The narrator is called Eddie Adams and his nickname is Eddie Munster. I actually lifted the name from a character in another unfinished novel. I liked it so much I wanted to use it again. I might go back to that novel at some point�but now, I�ll have to come up with a different name! I�m a big Stephen King fan and there are a couple of references to King novels in The Chalk Man. Mr Halloran is obviously a reference to The Shining and there�s a scene at a funeral which contains a nod to Pet Semetary. Ed�s ghostly visitor was inspired by An American Werewolf in London. When I was about 13 I used to go around to my friend Kirsty�s house to watch videos. We didn�t have a video recorder at home and her parents were pretty �relaxed� about what we watched! The recurring and gory ghost of David�s friend in that film always stuck with me. Although the chapters in The Chalk Man alternate between 1986 and 2016, I wrote all the 1986 parts first. That helped when it came to writing the children as adults because I already knew what had formed them. I never considered writing the book in two parts. I always felt that the reader should follow both stories at once, without knowing the outcome of either until the end! The town of Anderbury is based upon the small Wiltshire town of Salisbury where I was born. It has a cathedral, a fast-flowing river, and several parks. Sadly, it no longer has a Woolies on the high street. That�s now a New Look! I was working as a dog-walker when I wrote The Chalk Man, chasing wet dogs through muddy fields for hours a day, in between looking after my little girl. Time was limited and I had to fit the writing in whenever I could. In hindsight, it was good grounding. I don�t need to go away to a log cabin with scented candles and whale music to write. I can do it pretty much anywhere. I�ll be deep into a creepy scene in a book and still able to hold a conversation with my little girl about Peppa Pig! An 80s setting, a small town with dark secrets, and a gang of pre-teens on bikes. Yep, it�s easy to see why The Chalk Man has been compared to Stranger Things. But the book was actually written over the summer of 2015, a full year before Stranger Things hit the TV screens. Spooky! C.J. Tudor lives in Nottingham, England, with her partner and three-year-old daughter. 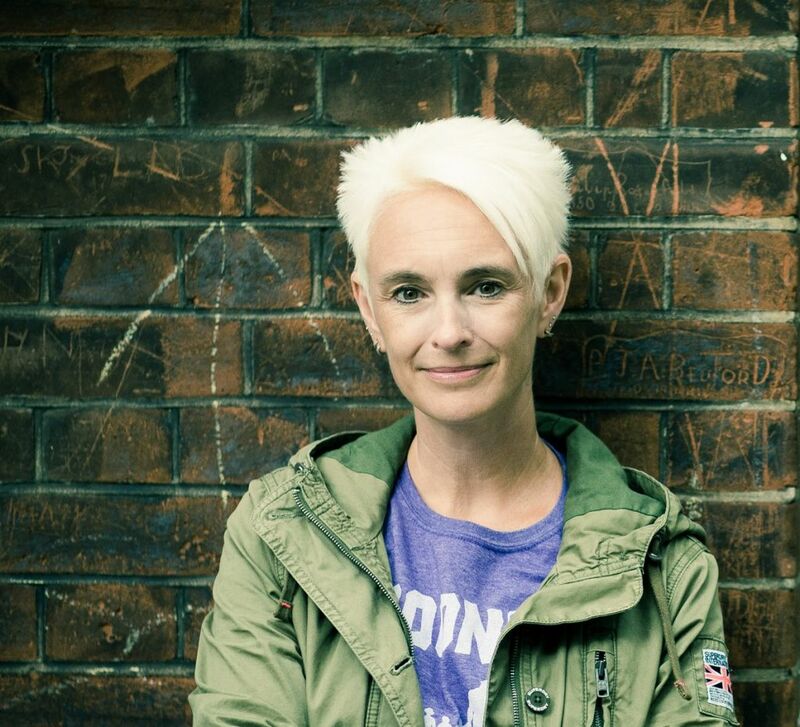 Over the years she has worked as a copywriter, television presenter, voice-over, and dog walker. She is now thrilled to be able to write full-time, and doesn�t miss chasing wet dogs through muddy fields all that much. Facebook | Twitter | Goodreads | Follow the Tour! Books � la Mode is giving away one print copy of The Chalk Man�yay!! What is your favorite art-related craft or hobby? I love watercolor painting and crocheting! Sponsored wholly by the tour publicist and publisher�a huge thank you to the lovely folks at TLC Book Tours and Crown Publishing! Giveaway ends January 25th at 11.59 PM (your time). The unforgettable story of Alexander Pushkin�s beautiful wife, Natalya, a woman much admired at Court, and how she became reviled as the villain of St. Petersburg. At the beguiling age of sixteen, Natalya Goncharova is stunningly beautiful and intellectually curious. At her first public ball during the Christmas of 1828, she attracts the romantic attention of Russia�s most lauded rebel poet: Alexander Pushkin. 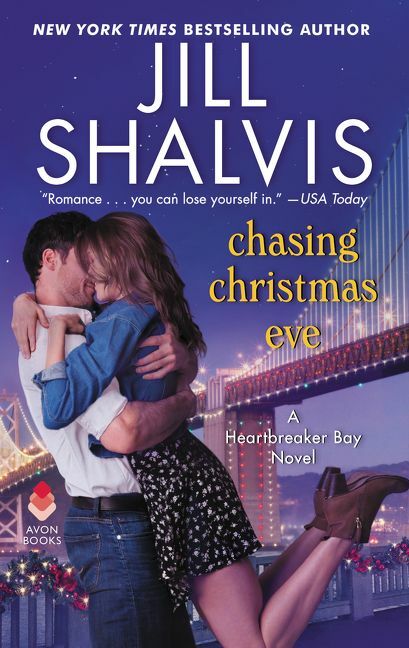 Finding herself deeply attracted to Alexander�s intensity and joie de vivre, Natalya is swept up in a courtship and then a marriage full of passion but also destructive jealousies. When vicious court gossip leads Alexander to defend his honor as well as Natalya�s in a duel, he tragically succumbs to his injuries. Natalya finds herself reviled for her perceived role in his death. 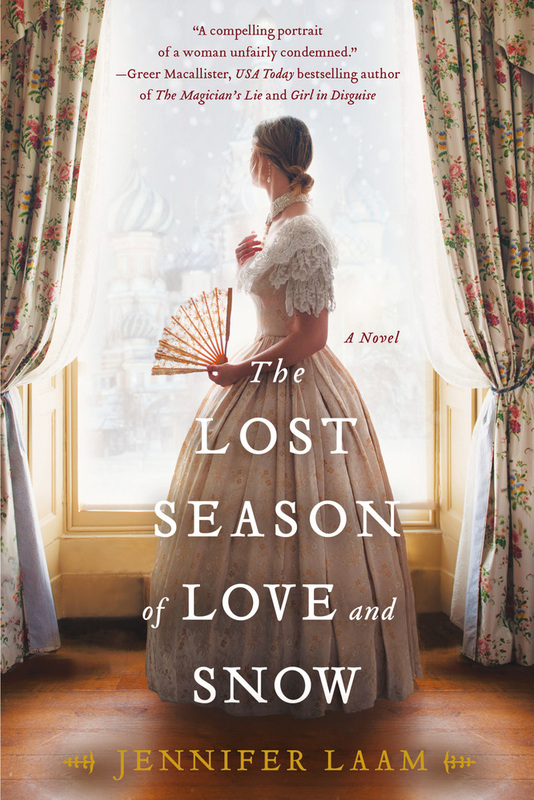 In her striking new novel, The Lost Season of Love and Snow, Jennifer Laam helps bring Natalya�s side of the story to life with vivid imagination�the compelling tale of her inner struggle to create a fulfilling life despite the dangerous intrigues of a glamorous imperial Court and that of her greatest love. Alexander Pushkin once described Natalya as his �Madonna with a squint.� When I read this, I immediately assumed she was near-sighted. I have terrible eyesight and can all too easily imagine the horrors of a world where glasses on women were unacceptable. Alexander describes his time writing as �stupid fits.� This is also from the historical record. While I can�t claim his genius, I can relate to this attitude toward writing... especially during NaNoWriMo (National Novel Writing Month). Natalya liked to create costumes for balls held at the imperial Russian court. I love dressing up every year for Comic-Con. Apparently, Natalya and I both crave attention. On the other hand, we both like to balance evenings out with nights at home. In the first chapter, Natalya looks wistfully at her notebook before she goes to the dance master�s ball. Similarly, evenings of writing, reading, and cat cuddling keep me sane. Natalya mentions that her first daughter can�t wait to be born so she can get out in the world as quickly as possible. That is essentially how my mom has described my birth. This one is unfortunate, but Natalya lives in a world where women are valued based on their attractiveness to men. Sadly, I don�t think the world has changed much in this respect. Writing this book forced me take a hard look at the assumption that women need to appeal to men in order to find happiness. Natalya is fascinated with Catherine the Great, just like me. I still see Catherine as a major inspiration for women, not just for her political savvy but her unconventional personal life. Alexander Pushkin wrote Mozart and Salieri, the basis for the play and the film Amadeus, one of my favorites. Needless to say, Alexander references the story and Mozart several times in my book. At one point, Natalya throws a copy of Pushkin�s Evgeny Onegin against a wall because she is desperate to know what happens next. This sums up how I felt after every episode of Game of Thrones. At some point, I read that Alexander Pushkin loved cats. By the time I had completed this novel, I realized that cats had worked their way into the book. Natalya�s mother�s cat bears a striking resemblance to mine. Books � la Mode is giving away one print copy of The Lost Season of Love and Snow�yay!! In The Lost Season of Love and Snow, Natalya creates several fabulous costumes including a recreation of a Minoan priestess from ancient Crete. What�s your all-time favorite costume? This can be something you�ve worn or an outfit from a book, movie, or TV show. I have always been satisfied with my Halloween costumes! Some of my favorites have been: diner waitress, French maid, geisha, and porcelain doll. As a very young child, I recall having people oohing and aahing over my Baby Bop, Sleeping Beauty, and hanbok costumes! Giveaway ends January 21st at 11.59 PM (your time).